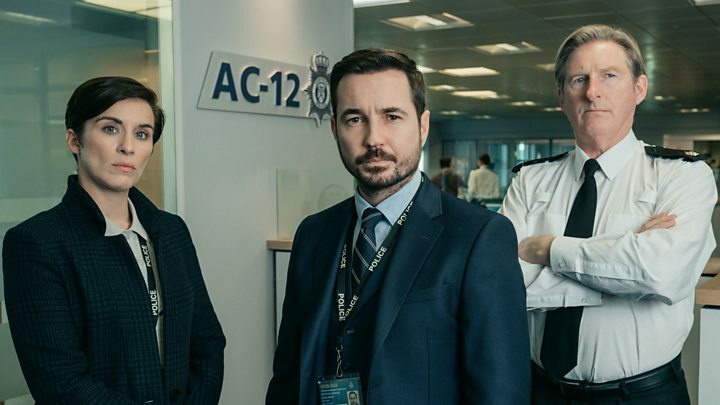 Sunday's episode of Line of Duty was the most-watched show of 2019 so far, according to overnight figures. The first instalment of series five was watched by 7.8 million viewers. That also made it the most-watched episode in the history of the police drama. In comparison, series four's opener was seen live by 5.4 million, with the finale watched by 7.5 million. The series five premiere went up against Victoria on ITV, with the period drama attracting 3.1 million. Line of Duty's return follows the success of writer Jed Mercurio's other hit show, Bodyguard, the opening episode of which was seen live by 6.6 million last year. Its finale drew a record-breaking 10.4 million viewers, according to overnight ratings. Overnight ratings measure live TV viewing and don't include catch-up. 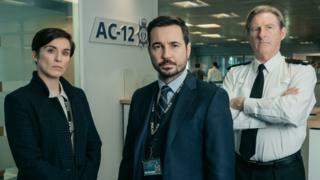 Line of Duty's series five opener, which was described by its star Martin Compston as "the scariest yet", received largely glowing reviews. The Times critic Carol Midgley gave it four stars and wrote: "[Jed] Mercurio knows how to begin an episode and is a master at ending one, last night giving us two final shocks like successive thwacks to the head. "It is a dependable, wily machine, superior in my view to Mercurio's other baby, Bodyguard." The Guardian's Lucy Mangan gave it a maximum five stars. "As ever, nothing is wasted; not a scene, not a line, not a beat," she wrote. "For every morsel of information gathered by the team and by the viewer, another turn reveals 100 hidden possibilities. "It fits together flawlessly - you can imagine Mercurio sitting like a watchmaker at his table with the parts spread before him and fitting the loupe to his eye before assembling the whole thing and listening for its perfectly regulated tick. Good times await. OMG." The Telegraph's Jasper Rees, giving the episode four stars, was also impressed. "Mercurio's script cleverly comes at a familiar scenario from a new angle," he wrote. And he praised the addition of Steven Graham to the cast. "Graham, a compact parcel of Scouse gelignite, doesn't tend to play softies, so his simmering aggression felt all too credible." He did sound a note of caution though. "Elsewhere there were hints that the script is overcooking itself... and how cartoonish were those silly biker villains seeking their long-lost drugs?" he wrote. Express reviewer Neela Debnath wrote: "Episode one has all the verve and energy we've come to expect from Line of Duty but season five also feels like it's now a continuation of a much bigger story that fully emerged at the end of the series four finale." Metro gave the BBC One drama five stars. Keith Watson wrote: "Few actors do menacing and brooding better than Stephen Graham and he's perfectly cast as John Corbett, a man on a short fuse with a steely coldness to his eyes and a way of making everything he says drip with sinister threat. Corbett's agenda is the lifeblood of this Line of Duty. "It's got balaclavas, it's got the mystery of the letter H, it's got spine-tingling interrogations to come. Line of Duty has the next five Sunday nights under house arrest."